Deep in Kenya’s Southern part of the Great Rift Valley, between Amboseli National Park and Maasai Mara National Reserve is the Shompole conservancy and where Shompole Wilderness a small and exclusive little camp is located. We offer both privacy and comfort in a unique location, close to Nairobi (3 hour drive) and welcome you to join us at our home. Nestled under the giant fig trees on the banks of the Ewaso Ngiro river, this small, homely and family run and managed tented camp is one of the few places in Africa that combines wildlife sightings in the Great Rift Valley with the stunning pink, red, and yellow colours of Lake Magadi and Lake Natron, both Lesser and Greater flamingoes and a welcoming Maasai community. We welcome you to our home, a place we love, cherish and help protect. at the bottom of the longest valley in the world – the Great Rift Valley. 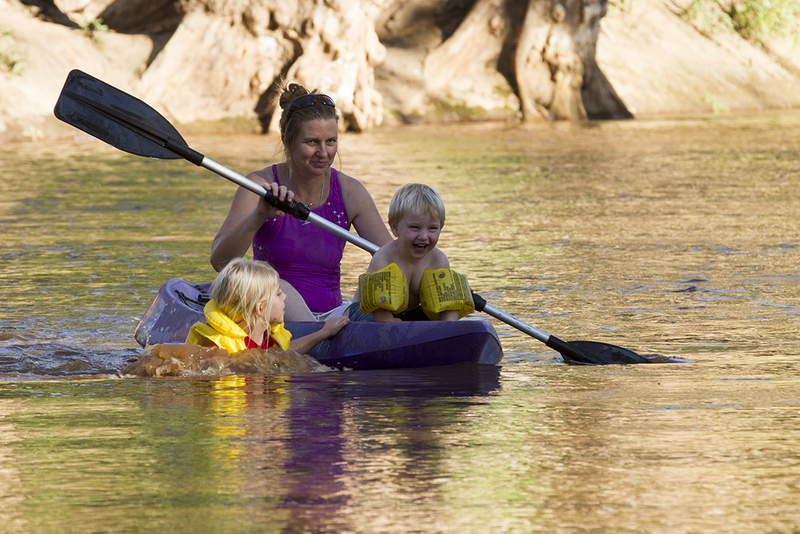 If you would like to float down the river in the home of the endangered Greater and Lesser flamingos, and many other wild animals, come visit Shompole Wilderness! 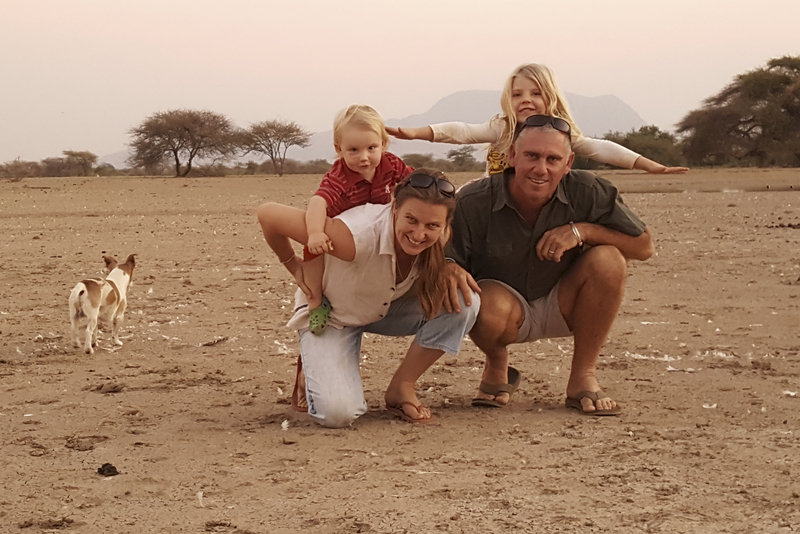 Our camp gives you the opportunity to experience an authentic African safari experience in our home: a place we love, cherish, and help protect. June – October / Mid December – February, but we are open through out the year. We take only one booking at a time giving you the exclusive use of whole camp to enjoy by yourself and/or with friends. 3-4 nights is best giving you enough to time to explore our section of the Great Rift Valley, its people, its wildlife and to enjoy our activities, all without restrictions of a national park and vehicles. Night time: 15 – 25 Celsius. There is always a bunch of fun things to do where there are very few restrictions. One of the best things about our ecosystem is that there are very few tourists around, giving you a very private time. The wildlife is great, we only lack rhino. 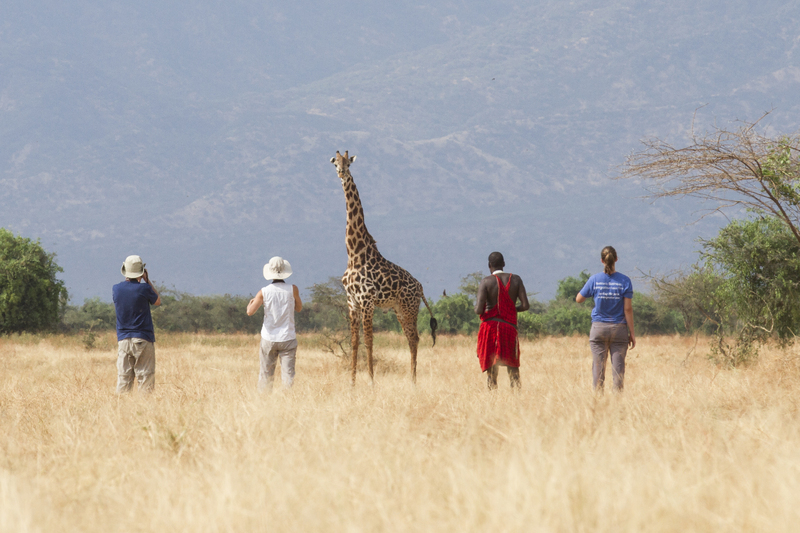 Walking and running with the plains game can be done right from camp on the open plains behind camp with a Maasai guide. 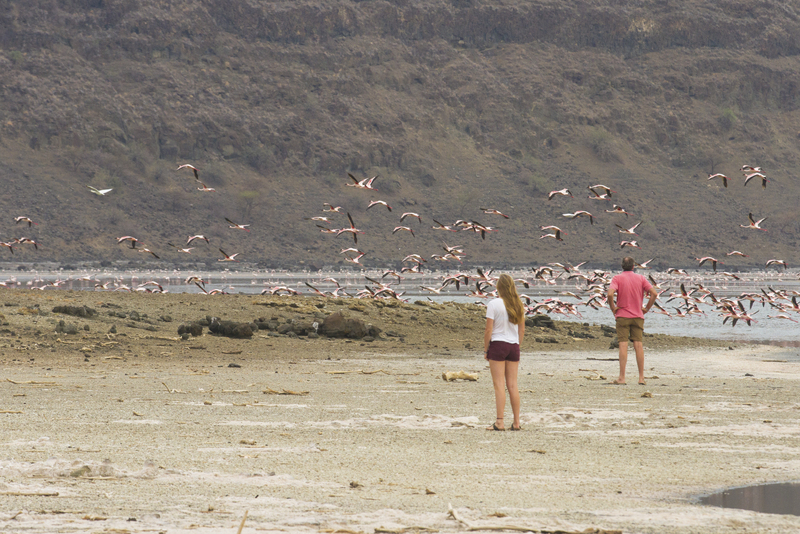 The flamingoes are a great spectacle and always bring a smile to everyone who sees them. At an extra cost, a helicopter flight over the flamingoes is very highly recommended. We ca drive or one can fly over Lake Magadi & Lake Natron come highly recommended. 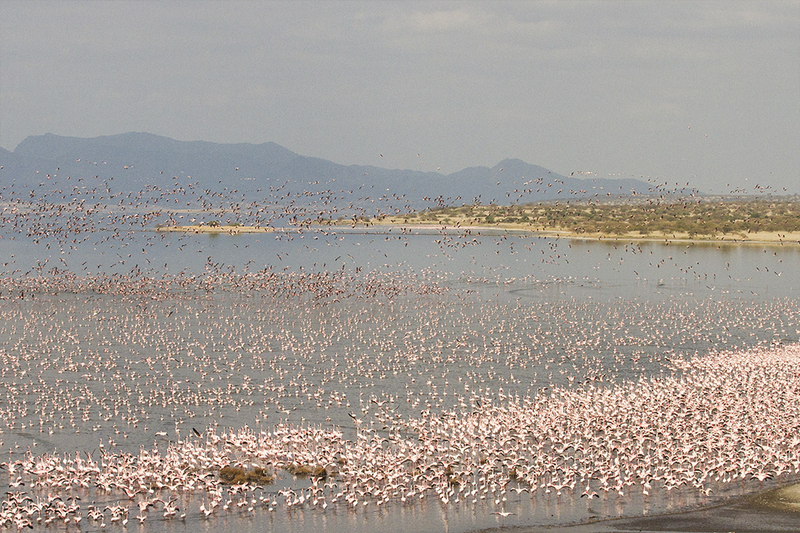 The lakes have Lesser and Greater flamingoes and an incredibly beautiful birds. They are amongst over 450 birds species we have in our ecosystem. 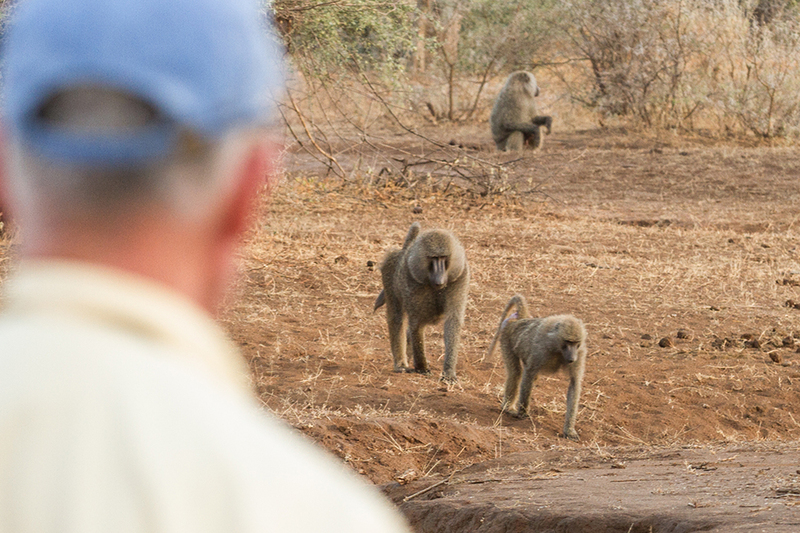 Every one treks mountains to see Gorillas or the Chimps, but here you can follow a troop of Baboons that have been habituated and are studied every day by Sisco from the Lale’enok Resource Centre. No where else in Kenya is this done. Lucky for us there are no crocs in this river, allowing us to use it freely. High on the list is kayaking and tubing where we float down the river for a few kilometres back to camp, it is a very effortless activity and we often see the rare colobus monkeys jumping over head. It has always been a dream of Johann’s to have his own camp. That dream came true and now he lives most of the time in Shompole with his wife Samantha and their two children Seyia and Taru. They both work in the ecosystem. Samantha works for SORALO and heads up the research in the area and together they have made this their home in the wild. The kids are home schooled in the wild! A safari veteran / guide came to see us in camp in the beginning and said that the Shompole area reminds him of the Old Africa he knew when he was a child. Since then, several guests have mentioned words along the same lines. Shompole is big sky country. it is an area with swamps, open plains, fig forests, rivers and is abundant in wildlife, traditional Maasai all set with the western wall of the Great Rift Valley as our back drop. We love the area because we are not confined to the vehicle, the Maasai have allowed us to freely use the area almost like it was our own. We are not restricted to vehicles, we enjoy mostly getting out and getting the real feel of Africa. 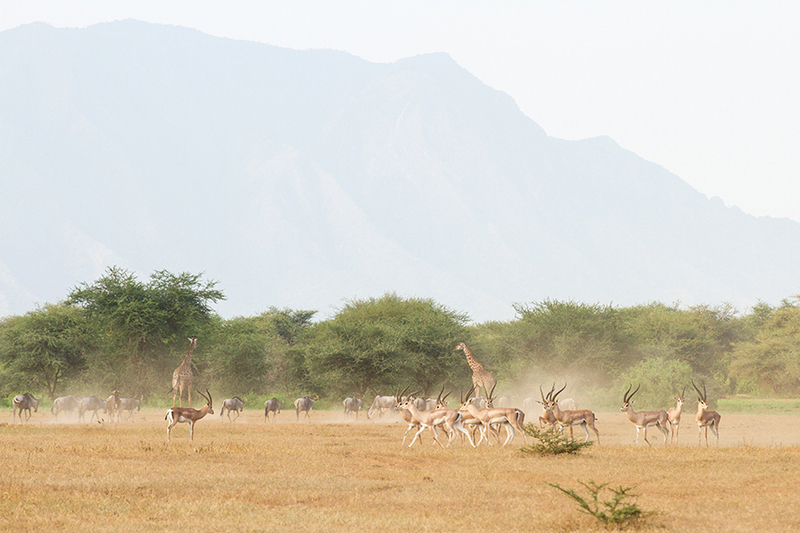 We are free to use over 250,000 acres of the Shompole ecosystem with hardly any other tourists around. It’s a real gem.